Fashion House is within 10 minutes' walk of Plaza de Catalunya, Las Ramblas and Urquinaona Metro Station. This former Eixample fashion house has an open air terrace. Rooms at the Fashion House feature high ceilings and traditional décor. All come with air conditioning, heating and either a private or shared bathroom. Other facilities at Fashion House include a communal living room and a large terrace, where breakfast is served. The hotel is situated close to many restaurants, bars and cafés. Fashion House is just 550 metres from Passeig de Gràcia. It offers easy access to the Gothic Quarter and Born districts. Set between the 2 main squares at the center of Barcelona – Catalunya and Universitat – this small, modern hotel is ideally located for exploring the city’s cultural heart. The Marvi just off the top of the vibrant La Rambla and a short walk from the Gothic Quarter. It is only 109 yards from Plaça Catalunya and the start of the elegant boulevard of Passeig de Gràcia – site of Modernist marvels such as Casa Batlló. Start your day of sightseeing with the delicious complimentary breakfast served in the bright breakfast room. Here you can take advantage of the great family service offered in this small property. After seeing the sights, spend a restful night’s sleep in your own spacious bedroom. In it you will find amenities such as a digital TV, free safe and a private bathroom with full bathtub. In addition, climate control allows you to stay in comfort all year round. Holiday Inn Express Barcelona City 22@ is in the city’s 22@ District, 320 yards from Llacuna Metro Station. This hotel features rooms with satellite TV and a free continental buffet breakfast. The Barcelona City has simple, contemporary décor throughout. Rooms are spacious and air-conditioned. Each has a tea and coffee maker, a desk and a hairdryer in the bathroom. The hotel has Wi-Fi access, which is available for an extra fee. There is also a computer and printer for guest’s use. The City 22@ is ideally located for visiting many of Barcelona’s attractions and the beach is less than half a mile away. Plaza de Catalunya and the famous Las Ramblas can be reached in less than 20 minutes, by Metro. Murmuri Barcelona is set on Barcelona’s charming Rambla de Catalunya Boulevard, surrounded by shops and sidewalk cafes. This boutique hotel features stylish rooms with flat-screen satellite TV and an iPod dock. Guests at Hotel Murmuri Barcelona enjoy free access to the gym and rooftop pool at the 5-star Hotel Majestic, just over a quarter mile away. Murmuri's design combines original 19th-century features with tasteful modern interiors. Rooms are decorated in neutral tones and feature elegant dark wood furniture. The Murmuri restaurant serves Mediterranean and local cuisine. Guests can enjoy music, drinks and snacks on the terrace in Passatge del Murmuri. Located next to Diagonal Metro Station, the hotel is within a 10-minute walk of Gaudi’s La Pedrera and Casa Batlló. Direct trains to Barcelona Airport stop at Passeig de Gracia Station, just under half a mile away. Set on Las Ramblas and next to Plaza Catalunya, the Hotel Continental offers charming rooms with free Wi-Fi and a fridge. A free continental buffet is available 24 hours a day. Decorated in pink, the Continental's air-conditioned rooms include a private bathroom and flat-screen TV with satellite channels. A microwave and dishes set are provided, and guests are welcome to fill the in-room fridge with food from the buffet. Hotel Continental Barcelona operates a 24-hour front desk, allowing guests flexibility during their stay. Currency exchange and car rental can be arranged at the hotel’s tour desk. The hotel is a one minute walk from Catalunya Metro Station. The Raval and the Gothic districts are a 10 minute walk from the Continental Hotel. Barcelona’s Museum of Contemporary Art is 330 yards away. Stay in the refined elegance of this classic hotel, set in a renovated, 19th-century palace surrounded by classy boulevards right in the heart of Barcelona. As soon as you enter the Continental Palacete you will experience a feel of luxury thanks to the exquisite Baroque decor. This elaborate interior features priceless chandeliers and elaborate frescoes, and combines with modern facilities such as free Wi-Fi throughout to provide a unique setting for your visit. Start each day with a delicious hot and cold breakfast. The Hotel Continental has a varied food and drink buffet on offer throughout the day and evening. The hotel lies on the elegant Rambla de Catalunya, just a 5-minute walk from the city’s main square of Plaça Catalunya. The surrounding streets are full of Barcelona’s distinctive architecture, smart restaurants and exclusive boutiques. Set just off Barcelona’s famous Las Ramblas, the Apartments Ciutat Vella offer modern apartments on a pedestrian street in the Gothic Quarter. La Boquería Market is just 100 ft away. The air-conditioned apartments combine authentic features, such as traditional stone walls and wooden beams, with modern design and free Wi-Fi. The lounge area comes with a flat-screen TV and the contemporary kitchen includes a microwave. Guests at the Apartaments Ciutat Vella have free access to the outdoor swimming pool at Hotel Ciutat Barcelona or the hot tub at Hotel Ciutat Vella. The apartments are surrounded by popular shops, boutiques and cafés. Liceu Metro Station is just a 2 minute walk away, and you can reach Barcelona Port and Plaza de Cataluña after a 10 minute walk. Bed and Breakfast Via Laietana is centrally located in Barcelona’s Gothic Quarter, 2 minutes' walk from the Cathedral. It features communal kitchen and free Wi-Fi. The spacious, air-conditioned rooms at Via Laietana feature simple décor and tiled floors. All rooms feature a shared bathroom and views of the Cathedral. Other facilities at the bed and breakfast include TV room with DVD player, luggage storage and tour desk. Breakfast is served in the kitchen. The Via Laietana is situated 5 minutes away from Plaça de Catalunya and its Metro, bus and train connections. Local attractions include Las Ramblas, Barcelona Cathedral and the Picasso Museum, which are all within 10 minutes’ walking distance of Via Laietana. These stylish, modern apartments are located in the district of Barceloneta, surrounded by seafood restaurants and set beside the city’s sandy beaches. Recently refurbished, the ClassBedrooms can accommodate between 2 and 4 people. They allow families and groups of friends to enjoy independent accommodations in the heart of the Catalan capital. The apartments’ location near to train, metro and bus services mean that you can easily visit the many cultural sights of this inspiring city. Las Ramblas and the lively district of El Born are only a short walk away. This historic fishing district is also a short distance from the Olympic Port. A 10-minute walk from Bogatell Beach in the 22@ district, the Confortel Barcelona has free Wi-Fi. Just over 1 mile from the CCIB Conference Centre, it features a rooftop pool and terrace. All stylish rooms at the Confortel are air-conditioned and have a large private bathroom. They also come equipped with a flat-screen TV and a minibar with some free bottles of mineral water. The restaurant at the Confortel specializes in Mediterranean cuisine using seasonal products. Set menus are available and there is a snack bar. Llacuna and Poble Nou Metro Stations are within 320 yards of the hotel. This includes easy access to the center of the city. The tourist bus also stops nearby. This hotel is officially adapted for guests with reduced mobility. Set in a 19th-century building beside the enchanting Palau de la Música building, these chic and spacious apartments offer fashionable accommodation in the city’s historic heart. Spend your Barcelona vacation in style with a stay at Las Ramblas Apartments III. The interior of each apartment comes with tiled and parquet floors to complement the stylish design. Look out over the vibrant local streets from your own pleasant balcony. Prepare your own meals in the apartment’s well-equipped kitchen. Other great amenities feature music equipment, satellite TV and air conditioning for the warmer months. As soon as you walk out of your apartment you will find yourself in the fashionable, central district of El Born – full of chic bars, restaurants and boutiques. The Gothic Quarter and La Rambla are also just a short walk away. These modern apartments occupy a 19th-century building in the Gothic Quarter of Barcelona. They are just 550 yards from the Ramblas and 55 yards from Plaça Sant Jaume. All of the light Las Ramblas apartments have 2 bedrooms, a lounge, bathroom and kitchen. They also have free Wi-Fi, balconies and satellite TV. Jaume I Metro station is about 270 yards away, while the port can be reached in about 10 minutes. The surrounding area has a wide range of restaurants and bars. These apartments are located in the district of L’Eixample, to the right in the old city, next to the Sagrada Familia. The modernist building that houses the apartments has been recently reformed and refurbished to include an elevator so as to provide all the comforts to make your stay a pleasant one. Including 3 double bedrooms, the apartments can hold up to 8 people and are a good choice for family stays. The Sagrada Familia church area is perfectly connected to the old city. This world heritage site area boasts a large number of bars, many with terraces along Avenida Gaudí, leading to Hospital de Sant Pau. Located 50 yards from Las Ramblas and across from Gaudí’s Palau Güell, Happy Apartments offers free Wi-Fi. In Barcelona’s Raval District, it features well-equipped apartments with stylish décor. Each air-conditioned apartment at Happy Apartments has a spacious living room with a sofa, TV and DVD player. Kitchenettes come equipped with an electric stove, fridge and teakettle. There is a selection of shopping in the streets surrounding the apartments. Guests can find a range of bars, cafés and restaurants on Las Ramblas and the nearby Gothic quarter. Drassanes Metro Station is a 5 minute walk from Happy Apartments, and connects guests to Passeig de Gràcia and Plaza de Catalunya in 5 minutes. Barcelona’s Port Vell is 550 yards away. This is a tranquil and comfortable guesthouse, situated in Ciutat Vella, the most charismatic quarter of the city, near the port. Pensión Segre offers a wide variety of room types to tailor to your individual needs. All rooms are housed in the warm, family atmosphere of the establishment and there is a 24 hour porter and reception service. The house is perfectly connected to the metropolitan transportation system. Many of the main sites of interest in the city are also within walking distance. For example, the traditional fishing district Barceloneta with its typical tapas bars or the bohemian Born district with its fashionable shops and bars is nearby. This establishment is housed in a building of great artistic interest, built at the beginning of the 19th century. The building is tranquil and comfortable and has conserved part of its original decoration. Simple accommodations are combined with a warm and homey atmosphere are offered here. Pension 45 is perfectly positioned in the center of the old town, with good connections to the public transportation network, enabling you to move within and around the city. The Renfe train station is only yards away from the Pension. This is the ideal place from which to see the heart of Barcelona and benefit to the maximum from its culture, shopping and nightlife. Nearby are also the MACBA, Las Ramblas, Plaça Catalunya and the central University building. These studio apartments are located next to the Picasso Museum, Santa Caterina Market and in the heart of the bohemian Born and Gothic Quarter. They offer a 24-hour front desk and free Wi-Fi. Apartments in Barcelona Corders are housed in a renovated building, with a private elevator to each apartment. Each stylish studio is decorated in light colors, using traditional materials such as stone and wood. Each studio has a small kitchen corner with a fridge and a stove or microwave. The local district of the Born has a wealth of bars, restaurants and nightlife from which to choose. From the Corders apartments you can also walk to Las Ramblas, Barcelona Port and Barcelona Beach. These apartments are situated in a historic building that has been renovated to offer very comfortable accommodation. The apartments are ideal to enjoy total independence when you visit Barcelona and sample the unique ambiance of its Gothic quarter. You will feel at home in these apartments and they boast all the necessary comforts for a stay with your couple or for business motives. The establishment provides free WiFi internet access and all the services you will need are situated nearby. The apartments are located in the heart of the Born district of the city, famous for its numerous restaurants, shops and art galleries. This is an ideal place to stay as you can reach many attractions such as the beach or Parc de la Ciutadella on foot. These apartments boast a highly privileged location, opposite the Cathedral and 100 yards from Las Ramblas. These are urban apartments well-situated in the Gothic Quarter. The building dates from the 18th century but was completely refurbished in 2005 (please note, there is no elevator in this building). Apartments boast a large lounge with a double sofa bed, a modern kitchen equipped with all appliances and with 2 windows opening onto balconies with views to of the pedestrian area below. The modern decoration and luminosity of these spaces give the flat a warm Mediterranean feel. These apartments boast a highly privileged location close to the beautiful Passeig de Gracia, one of the main and the most elegant streets of the city. The apartments are all situated in a modern building equipped with an elevator. The building was built in the early 1820s and was completely restored in 2004. These elegantly furnished one bedroom apartments have all modern facilities and a beautiful balcony overlooking some of the main central streets of Barcelona. The area has plenty of fashionable restaurants and cafes and elegant shops and is a few minutes walk from some of Gaudi’s most renowned creations. Located in the trendy area of El Born, near the port area of the city, these renovated apartments give you wonderful views over the Passeig del Borne. Enjoy a relaxing stay in these apartments. They boast a highly independent and private atmosphere, ideal for booking a stay as a couple or family. You can look around the beautiful shops and boutiques of the Borne district and grab a coffee in one of the trendy cafes. These apartments are located only 5 minutes on foot from the center of Barcelona and a short walk from the Sagrada Familia Cathedral in the Gothic Quarter. These cozy apartments are fully-equipped and furnished and situated in one of the best areas of Barcelona, near shops, the beach and the old town. The apartments boast an elegant, cozy and relaxed atmosphere and they are the perfect option for enjoying a highly private or independent atmosphere. All of the apartments have easy access to the metropolitan transportation network and are a practical option for short stays for leisure or business purposes. Consult the “Room information” section to see the exact location of each apartment. These apartments provide an alternative way to see Barcelona. Located in the best areas of the city these are quality tourist apartments. These fully equipped apartments offer a highly private or independent atmosphere, whether you are booking a stay as a family or a couple. They are also ideal for booking a stay for business purposes and give you the space to relax after a long day of work. This is the most direct way to experience the life, culture and people of Barcelona. The apartments are located different addresses. Click 'More Information' when checking availability for information on where the apartment is located as well as for pictures and a description. Set in Barcelona’s vibrant Raval district, this design hotel offers free Wi-Fi, a gym and a roof terrace with pool and panoramic views. Rooms include Nespresso coffee machines and iPod docks. Each bright, air-conditioned room at the Barceló Raval features a large plasma-screen TV with more than 70 channels. Rooms have a minibar and a modern bathroom with shower. Hotel Barceló Raval’s B-Lounge serves creative Mediterranean food, tapas and cocktails in stylish surroundings. You can also enjoy a drink on the outdoor terrace. The Raval Barceló is only a 5-minute walk from the MACBA Modern Art Gallery. Liceu Metro Station, Las Ramblas and the famous Boqueria Market are all just 440 yards away. These apartments are located in the historic center of Barcelona, a short walk from the Ramblas. The apartments at Apartments in Barcelona Guardia are equipped with all modern comforts so that you can enjoy a highly private or independent atmosphere, whether you are booking a stay with the family or a group of friends. The building itself has an elevator and a magnificent terrace for communal use where you can organize barbecues or simply relax in the middle of the city. You can easily visit the nearby Gothic Quarter that is only a few minutes by foot from the city port and beach front. Hostal Abrevadero is 300 ft from Barcelona’s Parallel Metro Station, and a 10 minute walk from the Ramblas and port. It offers a Wi-Fi zone, 24-hour reception and daily cleaning. Just 1000 ft from Montjuïc, the Abrevadero guesthouse offers both rooms and apartments. All have a private bathroom, TV and a fan. The apartments have air conditioning, a flat-screen TV and 2 bathrooms. There is also a lounge-diner and a well-equipped kitchen area. Abrevadero has a tour desk and you can rent a bike. Baggage storage is offered, as well as a laundry and ironing service. Parking is available nearby for an additional fee. Casa con Estilo B&B is in an early 20th-century building, in Barcelona’s elegant Sant Gervasi District. It is 165 ft from El Putxet Train station, and features terraces with panoramic city views. Free Wi-Fi is available in all areas of the guesthouse. Free wired internet is available in public areas. From the Casa con Estilo, it is 10 minutes by public transportation from Plaza Catalunya, Barcelona’s main square. You can walk to Park Güell and the CosmoCaixa Science Museum in less than 20 minutes. All rooms at the Casa con Estilo B&B are air-conditioned, and have décor inspired by different artists. You can choose between rooms with a private or shared bathroom. Casa con Estilo B&B has a daily homemade breakfast. Packed lunches are also available upon request. There is a tour desk and 24-hour front desk. These stylish apartments are located in the center of Barcelona’s fashionable Born area, just 165 ft from Santa Maria del Mar. They have free Wi-Fi and a private balcony. The Apartments In Barcelona Dames are modern and have modern furniture. Each has a kitchen with stove top, microwave and fridge, as well as a modern bathroom. Jaume I Metro station is just 820 ft away, while Ciutadella Park is just 5 minutes’ walk away. The Picasso Museum in the Gothic Quarter can also be reached in about 5 minutes. The Born area has a large range of bars and restaurants. These apartments are located in the residential neighborhood of Sarrià-Sant Gervasi, only 10 minutes from Plaça Catalunya. The apartment hotel complex boasts attractive and spacious rooms that make your stay a more comfortable and pleasant one. It also has excellent public transportation access to the center of Barcelona. This designer hotel is in an excellent location in a quiet side street only 65 ft from the famous Las Ramblas. Free Wi-Fi is available throughout the hotel. The Hotel Atlas is in the historic center of Barcelona. It is a short walk from the Boquería Market, the Liceu theater and the cathedral. All rooms at the Hotel Atlas are fully soundproof and air-conditioned. They have a teakettle, work desk, flat-screen TV and a free safe. The hotel rooms and public areas are totally smoke-free. The ticket service can help book tickets, including for FC Barcelona soccer matches. Other useful services include bike rental and a tour desk. Car rental and currency exchange are also available. A 5-minute walk from Diagonal and Fontana Metro stations, Hcristina is set in Barcelona’s bohemian Gràcia district. It features a 24-hour reception, and modern rooms with hydromassage showers. Hcristina's simply decorated, air-conditioned rooms are soundproofed. Each room has a TV, desk and private bathroom. Guests can enjoy a continental breakfast in the Hcristina’s café, where free Wi-Fi is available. Restaurants and bars can be found in the streets surrounding the hotel, while the popular Plaza del Sol is just 500 metres away. Gaudí’s La Pedrera and Casa Batlló are within 15 minutes’ walk of the hotel. Las Ramblas and Plaza de Catalunya are just 2 Metro stops from Diagonal station. In Barcelona’s Gothic Quarter, Hotel Catalonia Port offers free Wi-Fi and a terrace with a small seasonal outdoor pool. Each air conditioned room has a flat-screen TV with satellite channels. The hotel’s contemporary El Racó del Port restaurant opens from Monday to Saturday, serving seasonal Mediterranean cuisine. A varied buffet breakfast is offered in the dining room, and there is also a lobby bar. The Catalonia Port Hotel offers stylish rooms with hardwood floors. They all include a safe, a minibar and a private bathroom. Catalonia Port is just 800 ft from the bottom of the famous Las Ramblas, and Port Vell Harbor is 1300 ft away. Drassanes Metro Station is a 5-minute walk away. 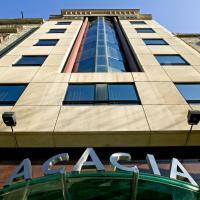 Acacia Suite is in Barcelona’s Eixample district, just 55 yards from Hospital Clinic Metro Station. It offers air-conditioned apartments with free Wi-Fi and a shared roof terrace. The modern apartments feature a lounge with carpeted floors, sofas and a TV. The kitchenette includes an electric stove, coffee maker and a microwave. Bed linens and towels are changed daily. The Acacia serves a daily continental breakfast in the dining room. The apartment-style hotel also has a free business center. Board games are also available. The Acacia offers discounts on Barcelona’s popular tourist bus. The city’s financial district is half a mile away, and you can reach Passeig de Gràcia Boulevard in 3 minutes by metro. Hotel Atlantis can be found less than 100 yards from Plaza Catalunya and Universitat Metro Station in Barcelona. It offers attractive rooms with flat-screen satellite TV and free Wi-Fi. The hotel features lounge areas with sofas where guests can relax. Car rental can be arranged at the 24-hour front desk. A hot and cold breakfast buffet is served in the hotel dining room. The air-conditioned rooms at Atlantis include a spacious marble bathroom complete with a hairdryer. There is also a laptop safe. The Gothic Quarter is less than a 10 minute walk from Atlantis Hotel. The Picasso Museum and El Born district are also a short walk away. ABaC Restaurant Hotel Barcelona GL Monumento features stylish rooms with Bang & Olufsen plasma TVs, spa bathtubs and rainfall showers. The hotel has a 2-Michelin star restaurant, run by renowned chef Jordi Cruz. This boutique hotel has a zen garden and a spa with a hot tub, pool and tatami. There are 2 treatment cabins. There is a Lounge Bar, and you can visit the spacious gourmet kitchen. Room service is also available 24 hours. All the soundproof rooms feature ultra-modern décor, free Wi-Fi, a Nespresso coffee machine and satellite TV. The bathroom has a bathrobe, slippers and Hermès toiletries. Rooms also have remote-control lights, heating and blinds. The staff can arrange limousines and other luxury vehicles. Avinguda Tibidabo FGC Station is just 100 yards from the hotel and connects guests to Plaza de Catalunya in 10 minutes. The ABaC is on Avinguda Tibidabo, an upscale residential area of Barcelona. Equity Point Centric is on Barcelona’s Passeig de Gràcia, 0.3 miles from Plaça de Catalunya. This well-equipped hostel features free breakfast, Wi-Fi access and a guest kitchen. The dorms and rooms at Centric are spacious and air-conditioned. Bottom linen and pillow cases are provided and lockers are available. Facilities at the Centric include bar, common room and terrace. Guests can use the hostel’s tour desk and towel hire. Equity Point Centric is located a few minute walk from Gaudí’s Casa Batlló and La Pedrera. There are several restaurants, bars and shops on Passeig de Gràcia and in the surrounding area. Passeig de Gràcia Metro station is less than 330 yards from the hostel and the famous Las Ramblas is a 10minute walk away. Residencia Sants is 10 minutes’ walk from Sants Station and FC Barcelona’s Camp Nou Stadium. It offers a 24-hour reception and rooms with free Wi-Fi and a fridge. Sants Estació Metro Station connects you with the rest of the city with ease. Trains to Barcelona-El Prat Airport also leave from here. Rooms at the Residencia Sants feature tiled floors and simple décor. Each one comes with heating and a fan. You can choose between rooms with a private or shared bathroom. Guests with a student card will be given a free breakfast at the guest house. Albergue Pere Tarrés is a 10 minute walk from Sants Train Station and a few minutes by metro to Barcelona’s center. The hostel has a kitchen, restaurant and free Wi-Fi. 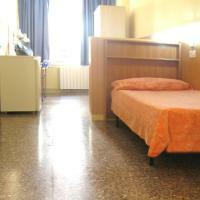 Rooms at Pere Tarrés Hostel are spacious and feature private bathroom, bed linens and lockers. Double rooms come with towels and other room types are offered a towel rental service. Other facilities at Pere Tarrés include a buffet breakfast, bar and bike rental. Guests also have access to a nearby pool and gym. Albergue Pere Tarrés is a 5 minute walk from Maria Cristina Metro Station. The hostel is about 15 minutes from Camp Nou Football Stadium and L’Illa Diagonal Shopping Center is nearby. Next To has an ideal location, 55 yards from Passeig de Gràcia Boulevard. This stylish hotel has 2 roof terraces overlooking La Pedrera and rooms with free Wi-Fi and flat-screen TVs. Next To´s rooms feature chic, contemporary décor. All air conditioned accommodations have satellite TV and some rooms come with kitchen facilities. The private bathrooms have solar-heated water. The Next’s restaurant serves Mediterranean cuisine. 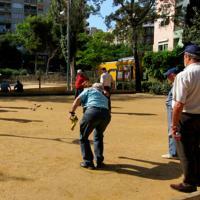 There is also a selection of restaurants and cafés in the nearby district of Gràcia, approximately 550 yards away. Diagonal Metro Station is a 5-minute walk from the Next To, and offers easy access to all parts of the city. Plaza de Catalunya and Las Ramblas are just 2 stops away. These modern apartments are situated in the popular district of Gracia and only a few minutes walk from Gaudí’s Parque Güell. The apartments are well-equipped to ensure your comfort; the kitchen comes complete with all kitchenware. Situated in the heart of the district of Gracia, there are numerous bars and restaurants to choose from, catering to all tastes. These apartments are the perfect option for enjoying a highly private or independent atmosphere. This is a tranquil area but with excellent connections to the heart of the city, you can get to the center of Barcelona in 10 minutes from here. Citytrip Ramblas offers stylish apartments and studios located around Barcelona. Each one has free Wi-Fi, cable TV and a DVD player. 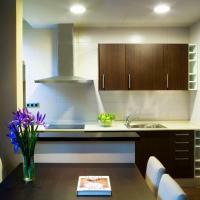 Each of the Citytrip Ramblas apartments has contemporary décor and a well-equipped kitchenette. Apartments have spacious sitting areas. 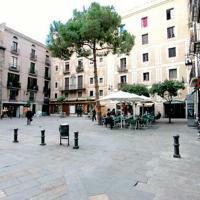 The apartments are in the charming Born district and the Ramblas, as well as Poble Nou and Barceloneta, near the beach. All have easy access to public transportation. Featuring a 1960s vibe and rooms with vintage décor, this hotel is in the heart of Barcelona, only a 2-minute walk from the famous Ramblas. Free Wi-Fi is available throughout the property. Each air-conditioned room at Chic&Basic Ramblas features a TV, a small kitchenette and a private bathroom. Most rooms have a balcony. Chic&Basic Ramblas has a bar and a restaurant. The staff at the 24-hour front desk can provide tourist information about the area. Bike rental services are also available, and there is also a stylish white billiards table. The nearest Metro Station is Drassanes, only a 2-minute walk from the hotel. You can also walk to the harbor or Plaza Catalunya Square in less than 10 minutes. Chic&Basic Ramblas is close to the Born district, with numerous trendy bars and restaurants serving local and international food. Just 165 ft from the famous Ramblas in Barcelona, Hotel Turin features stylish rooms with hardwood floors and furnishings. It has a lovely terrace and free internet throughout. The rooms at Turin include a flat-screen TV with satellite channels. They also have a private bathroom and hairdryer. The Gothic Quarter is just 500 ft from Turin Hotel and the Picasso Museum is a 10-minute walk away. Guests can walk to the beach in 20 minutes. The lobby-lounge has free teas and access to computers with free internet. The tour desk can provide useful information on the city and organize bike or car rental. A buffet breakfast is served. The Boqueria Market, a short walk away, sells delicious hams, cheeses and fruit. Overlooking Barceloneta Beach and central Barcelona, this design hotel has an outdoor pool and luxury spa. Hotel Arts offers a contemporary art collection, a casino and a Michelin-starred restaurant. The Arts is next to Barcelona’s Olympic Port and surrounded by stores and lively bars. Barceloneta Beach is 820 ft away, while Ciutadella Park is 1000 ft away. The Arts Hotel’s stylish rooms include a Bang & Olufsen flat-screen TV and sound system. The spacious bathrooms have a separate bathtub and hydro-massage shower. The hotel’s Enoteca restaurant serves fine Mediterranean cuisine, while the creative Arola is run by famous chef Sergi Arola. Hotel Arts also has a cafe and a champagne bar with seafront terraces. Hotel Arts has a hair salon and various stores, including a gift shop and delicatessen. The hotel also offers a multilingual concierge team. Situated on Barcelona’s Las Ramblas, this guesthouse is less than 655 ft from Liceu Metro Station. It offers simple, comfortable rooms and has free Wi-Fi access available throughout. The Hostal Boquería’s functional rooms feature air conditioning and cable TV, as well as heating and a safe. The private bathroom comes with a hairdryer. The Boquería serves a daily breakfast and has a 24-hour front desk. Guests can also make use of its baggage storage. The central location makes visiting Barcelona’s sights easy. The Boquería Market is just across the Ramblas. Barcelona Cathedral and the surrounding Gothic Quarter are within 5 minutes’ walk of Hostal Boqueria. Located 260 ft from Las Ramblas, this accommodations are in the Raval neighborhood of Barcelona. Apartaments Unió offers air-conditioned apartments with private balcony and free Wi-Fi. The Unió is next to the Liceu Opera Theatre, and is a 3 minute walk from Liceu Metro Station. Plaça Catalunya Square is only 10 minutes by foot. Surrounded by many bars and restaurants, the apartments feature balconies and double-glazed windows. They all have modern décor, parquet floors and bricked walls, while some of them also have a small terrace. Each apartment at Apartaments Unió comes with an open-plan kitchen, a washing machine and a living-dining room with a flat-screen TV. The private bathrooms have a shower. Hostal Baler offers good-value accommodations in a convenient location, with excellent access to the historic heart of Barcelona. This guesthouse is set 440 yards from Sants Train Station. Rooms at the Baler are comfortable and air-conditioned. They all have a private bathroom and satellite TV. Some rooms also have free Wi-Fi internet access. The guesthouse has a 24-hour reception, offering a tour desk and baggage storage. Hostal Baler is a short walk from Plaza España and Montjuïc. This hill is home to the MNAC Gallery, the Pueblo Español and the Magic Fountain. There is also a park and castle, with views of the city and sea. Housed in a reformed modernist building located in the center of Barcelona, these apartments are ideal for enjoying a highly independent and relaxing vacation in the city. MH Apartments Tetuan has a variety of apartments, all of which are spacious and charming in design. Relax in the tranquility of this accommodation at the end of a long day of sightseeing or business in the city. The apartments boast free WiFi internet access and a TV with international channels. The central location of these apartments means you can easily get around the city using the excellent public transportation or on foot. Apart-Ramblas108 offers modern apartments situated right on Barcelona’s famous Las Ramblas, in the heart of the city. 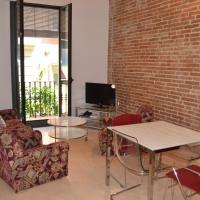 Each air-conditioned apartment has free Wi-Fi and most have a private balcony overlooking Las Ramblas. The stylish Apart-Ramblas108 apartments have a living area with an LCD TV and a well-equipped kitchen area with a microwave, toaster, coffee maker and washing machine. Bed linens and towels are provided. Apart-Ramblas108 is set on the edge of the Gothic Quarter, just 500 ft from the vibrant Boqueria Market and Liceu Metro Station. Buses to Barcelona Airport stop in Plaça Catalunya Square, a 3 minute walk away.